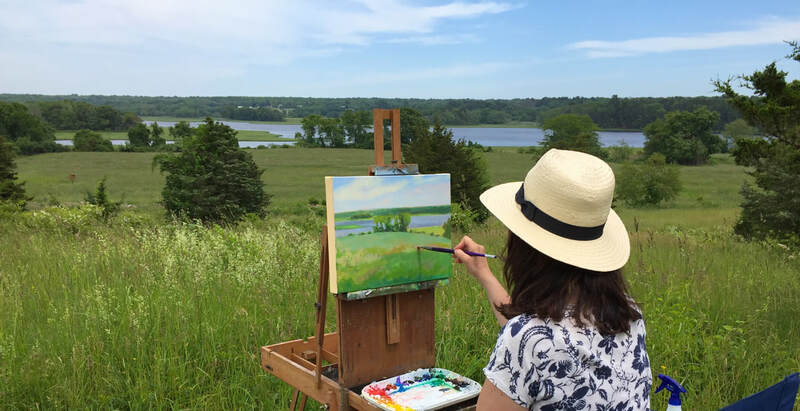 I live in a coastal, New England town with my husband, Stephen Remick, who is also an artist. My children are grown up and very creative. One is a talented guitarist and the other a gifted writer and artist. I'm extremely proud of both. ​I graduated with a BFA in Painting from Swain School of Design, a small art school in Massachusetts with a notable, inspiring, faculty that created a group of painting graduates who, through Professor David Loeffler Smith, can directly trace their lineage back to abstract expressionist Hans Hofmann. The “push and pull,” which Hofmann described as interdependent relationships between form, color, and space has influenced me. I also received the Yale University Ellen Batell-Stoeckel Fellowship. Today, my paintings are collected both throughout the United States and internationally. ​I am currently a member of Gallery X, www.galleryx.org in New Bedford, MA. Follow me on Instagram for the latest paintings and updates. THE ART DRIVE, August 6-7th, Dartmouth, MA 2016. GALLERY X, New Bedford, MA. Group Show, 2014. GALLERY X, New Bedford, MA. Group Show, 2013. UNIVERSITY OF MASSACHUSETTS, 2011. Swain Alumni Show, Dartmouth, MA. ARTWORKS!, Group show. New Bedford, MA. 2007. MARION ART CENTER. Marion, MA. 1996. MSPCC BENEFIT. Bridgewater, MA. 1995. FULLER MUSEUM OF ART. Brockton, MA. Members show. 1994-1997. GALLERY X. New Bedford, MA. Various group shows. 1990-91. DARTMOUTH GALLERY. Dartmouth, MA. “The Artist Within”. 1990. NEMASKET GALLERY. Fairhaven, MA. 1986. David Loeffler Smith who studied under abstract expressionist Hans Hofmann. Fuller Museum of Art, Members Show, Brockton, MA. 1997. Fuller Museum of Art, Members Show, Brockton, MA. 1995. Private Collection, Kowloon, Hong Kong. Private Collection, New South Wales, Australia. Private Collection, Baton Rouge, LA. Private Collection, West Newton, MA. Private Collection, Saint Louis, MO. Better Homes & Garden, June 2018. Copyright 2017, AnneCarrozzaRemick_ All rights reserved. Anne Carrozza Remick’s acrylic on panel “Morning Walk” features a middle-aged man in white baseball cap strolling with his beagle along a beach. It speaks of a certain kind of tranquility while embracing the formalism of a “painter’s painter.” Carrozza Remick caps a swatch of azure water with horizontal lines of beige, olive green, teal and baby blue. And it all works. " - Don Wilkinson, artist, art writer and critic.